After losing his belt against the number one contender, the once reigning champion known as Pato Box is stabbed in the back and left for dead by a mysterious attacker. However, this isn’t the usual story of a rise back to fame that you may think it is. This is the tale of a duck with a natural talent for boxing, hell-bent on revenge and ready to take on the whole of Deathflock – the organization that he had once pledged to be faithful to, resulting in a tale that actually has more in common to Kill Bill than it does Rocky or Southpaw. What stands as the most obvious comparison is that Pato Box is essentially a Punch-Out!! clone. You face a series of opponents with their own nutty personalities, and a fight pattern that you must learn to decipher should you wish to be victorious. For those who have never played Punch-Out!! before, the controls are very simple. The stick is used to dodge left and right while snapping down on it will raise your guard. You have a button for each fist that will land a body shot when pressed on its own, or towards the face if combined with shunting the stick upwards. It’s a tried and tested formula that works just as effectively today as it did way back in 1984. There are a few slight differences to the combat when compared to Little Mac’s puzzle fighter. Unlike Punch-Out! !, you don’t possess a stamina or a health meter to keep your eye on. Instead, visual clues will ensure you know how close you are to hitting the deck. You also cannot earn that special star ability to send a devastating power punch to the sweet spot on the chin either, nor is there a bell here to save you on points. In Pato Box, you fight each opponent in the course of three phases, each phase adding a new change in pattern and difficulty. Most of the fights aren’t even fought in a ring, although when things do heat up when entering the third phase, our champion will start to feel himself in a way where he will transition back inside the ropes, along with a cheering crowd thirsty for a knockout. A sort of happy-place if you will, for the pekin-that-packs-a-punch. Not to say that it gets any easier under the lights and on the canvas, because it really doesn’t. Pato Box is an incredibly tough game. While it is not unusual for a game like this to up the ante, the unforgivably high and early difficulty curve disrupts the balance of it all. Sure, laying the beat-down on an opponent after studying their pattern to a tee is always a satisfying feeling. However, the lack of tells and random patterns during the later phases can at times feel like the victory came from a stroke of luck towards the end, rather than a heavily-practised set of reads. What made Punch-Out!! on Wii such a clever puzzle game was how there was always some sort of new subtle hint that can be discovered to give you a clue as to when is the best time to attack or evade. This could eventually lead to tearing apart an opponent that was originally deemed an impossible task to begin with. In Pato Box, the timing of hints seems to arrive far later than they should. This gave me the impression that either the button input lags a bit, or the window between the hint and attack is too close together to read or react to. There was just something that felt slightly off to me with the inputs in how they would sometimes feel like they just didn’t respond in a way I wanted them to. To be fair, this complaint could also just be the result of me, whinging at getting my arse kicked over and over again. Or even pressing a punch button a frame too early from a dodge. Either way, it never appeared to be quite as sharp or responsive as the game it is trying to throw nods to. 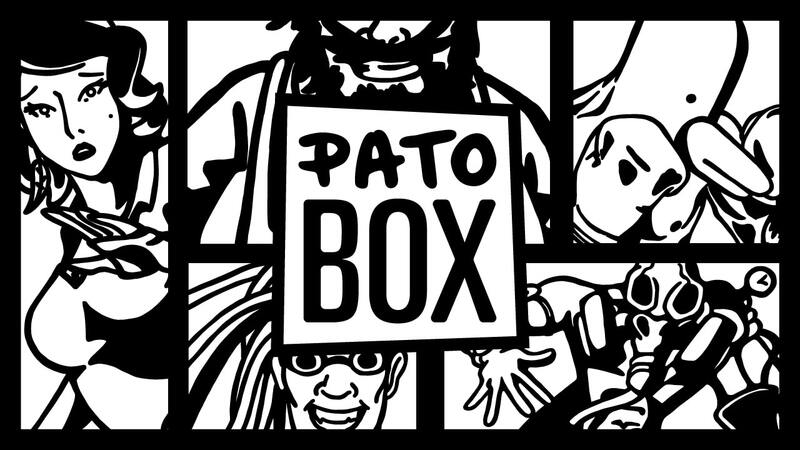 While the core fundamentals ride on a close track to Nintendo’s own boxing sim, Pato Box does manage to have plenty of tricks under its wings in an effort to separate itself from the classic puzzle puncher. First off, the enemy designs are very different to what I had expected. Like I said before, most fights don’t usually take place inside a ring, but rather a themed area that your foe favours. Take the Chef, for example, brawling over a giant pot of soup in the kitchen that is used as both his strength and his greedy weakness. Or the raving DJ scientist, forcing you to bob and weave along to the beat like a rhythm dancing game, while he flails around in the background like Keith from the Prodigy. Where the game really throws a hook from the left field is the tasks that you have to carry out beforehand to earn your way to face your opponent. It is these particular sections that completely breaks the formula that a Punch-Out!! fan would expect. Whether that be for better, or for worse. Outside of duking it out with Deathflock’s muscle, you have a bit more freedom to navigate around the joint. You can still punch stuff, but you no longer need to dodge in the conventional sense anymore. Instead, you are thrown into some rather bizarre situations to make use out of the classic DOOM-esque control system. For example, winning the required amount on gambling machines in a Casino to pay your way into a fight, or navigating through challenging death trap obstacle courses before you face your rival. Just working my way through the sharp deadly blades of the Chef’s abattoir really tested my patience to the limit, as I found it frustratingly difficult to hone in on the perspective of the 3D environment due to its one-tone, black and white comic book art style. While controlling the Duck in this way did eventually get the job done, it never really feels like a natural or desirable method of movement. The obstacle areas are probably the strongest sections outside of the bouts themselves as well, which isn’t saying much given the amount of tedious padding stuffed in between. As you would imagine, the answer to most of these minor filler tasks usually requires you to simply punch, or strafe your way out of it. The good news is that there’s also an Arcade mode that works as traditionally as you would expect and want if the idea of a story or the extra gameplay mechanics doesn’t appeal to you. The more I played Pato Box though, the more the game did gradually grow on me. Despite the disadvantage of depth in certain sections I constantly saw a challenge that needed to be beaten no matter how close I got to launching the Nintendo Switch at the wall. The sketchy black and white vector style artwork gave the whole experience an interesting look to it too, giving it a graphic novel aesthetic similar to the PlatinumGames-developed Mad World on Wii. I really dug the haunting electro-tones of the soundtrack that bled through the speaker. It doesn’t come across something that is usually found in a boxing setting, yet fits the dark vengeful tones of the gameplay and mood nicely. For motion control fans out there, you can hold the Joy-Con like you would do with ARMS. While its a neat idea in theory, in reality, it’s hard enough timing traditional control inputs, never mind relying on your own real-world boxing skills. I may have started this review stating that Pato Box is a straight up Punch-Out!! clone, and at its core it certainly is. However, while the abstract world where a fighting Duck seeks answers is a setup that just doesn’t make sense, it happens to mould nicely with its presentation. It’s far from a perfect game, and the filler sections in between predictably never live up to the actual fights themselves. Yet, in spite of all this, Mexican developer Bromio has managed to make decent use out of the Punch-Out!! formula to craft something unique enough to separate itself from other clones that came before it.